It seems everything we were told was a lie. Next thing someone will be telling us that ACME isn’t a real company. I’ve already posted about another aspect of this deception. Categories: Animals, Animation, Department Of Ruined Childhood, Fun, Popular Culture, Television | Permalink. Death Valley is home to the most iconic of desert birds—the roadrunner. Thanks to its Looney Tunes fame, the bird has become quite a tourist attraction. At the Death Valley National Park Visitor Center, sightseers can view roadrunners from large glass windows, and park officials often shout “meep, meep!” as they approach. However, the roadrunners don’t frequent the visitor’s center for the attention; they’re looking for fresh meat. 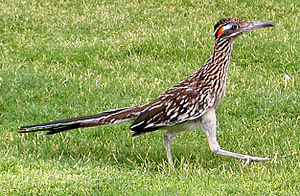 Unlike their cartoon counterpart, real-life roadrunners are skilled hunters that use their lightning-quick speed to catch mice, insects, and snakes. They’re also pretty sly. Some of these clever creatures have figured out that if they wait by the visitor’s center, sooner or later a tasty bird will accidentally fly into the glass windows. The roadrunners then pounce on the stunned animal, ripping it apart and eating it in front of the horrified onlookers, Tasmanian Devil-style. Never again will that ‘meep meep’ give rise to a sense of innocent amusement again, rather it will elicit grim foreboding. Categories: Animals, Department Of Ruined Childhood, What's All That About? | Permalink.